What's happening with the musical underground in Greece? Has it always been this divergent or has the recent economical situation brought a sense of nihilism and experimentation to the bands? Several bands from that area have this 'no-future'-like feel where every instrument and every genre are blended into something weird and new. Lately it seems like a new musical era is arising in Greece like punk did in the U.K. in the seventies. Bands throw away all their style-related prejudices and do whatever it takes to express their emotions and thoughts. Apart from the devastating crisis, this musical evolution is actually a good thing. From the biography: "Kooba Tercu is Johnny Tercu and five other guys which he calls 'the crew'. They have been spending a lot of time in a moist, rat & cockroach infested basement playing something wicked, loud and heavy. He ventures pointlessly into nothingness with the same sense of no future as most people in Athens these days. After endless hours of jamming, Kooba Tercu have distilled the ideas developed over a couple of years in ten songs resulting in something that sounds incredibly familiar but maybe not quite like anything you've heard before. This untitled debut was recorded live in the basement". You, our beloved reader, might want to sit down for this one because the biography is absolutely right. The album kicks off with' Ukunta'. Driven on heavy djembe percussion (think 'The Beautiful People' by Marilyn Manson but better), it turns into an awesome song that has no genre whatsoever. What follows is demented and experimental rock music, filled with strange riffs and often some creepy keyboards. 'Chika' might be one of the most rock related songs on the album but even for this one I have nothing to compare it to. 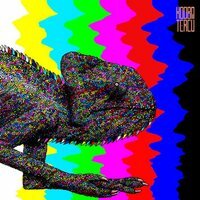 Maybe it's safe to say that Kooba Tercu walks the thin line between nu-metal, indie rock and noise rock, while incorporating some (post-) punk and a little bit of post-rock. They play it with the intensity of Sonic Youth or Sleepytime Gorilla Museum. But even all those references are quite futile. Mr. Tercu and his crew simply do whatever they want to, regardless of what anyone thinks about it. 'Disembarkation' and 'Spit Bucket' have the power to open a big can of headbanging. 'Batman' starts out as something that sounds like an error in the digital file I received. Perhaps jazz-lovers will appreciate this one the most. For the average rocker this song, and probably some others might just be a bit too experimental and bizarre. The award for songtitle of the year goes to the 'Squirting Squid', a solid modern rock song with an experimental edge.